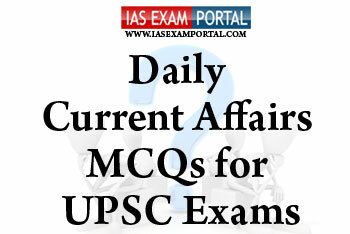 Current Affairs MCQ for UPSC Exams - 13 October 2018 | IAS EXAM PORTAL - India's Largest Community for UPSC Exam Aspirants. Q1The Prime Minister, Shri Narendra Modi, today attended, and delivered an address at the event to mark the launch of the Centre for the Fourth Industrial Revolution. 1) Centre pays 90 per cent of the funds required in a centrally-sponsored scheme as against 60 per cent in case of normal category states. 2) Constitution do have some provisions for categorisation of any state as a Special Category Status (SCS) State. 3) Non-viable nature of state finances along with Low per capita income can also be a criterion for being awarded a special category status. Q3The human capital index was released by the world bank as part of the World Development Report 2019.It claims to seek to measure the amount of human capital that a child born today can expect to attain by age 18. 2) Expected years of Quality-Adjusted School. 3) Health environment including adult survival rates & rate of under -5 stunting. 1) It Provides therapy and treatment over clinically relevant period of time and directly at site where it is needed, thereby reducing side effects. 2) These engineered systems provide active, therapeutic function in programmable, dosed format and then naturally disappear into body, without trace. 1) CIC and members are appointed by the President of India on the recommendation of a committee consisting of—Prime Minister as Chairperson, the Leader of Opposition in the Lok Sabha; a Union Cabinet Minister to be nominated by the Prime Minister. 2) The jurisdiction of the Commission extends over all Central and State Public Authorities. 3) One of the its primary functions include suo motu disclosures receiving and enquiring into a complaint on inability to file RTI etc.